Drynaria (Gusuibu)-Drynaria fortunei (Kunze) J. Sm. Part Used & Method for Pharmaceutical Preparations: The rhizomes are dug in any season. After they have been cleaned, the rhizomes are cut into slices and dried. 1. Deficient kidneys manifested as lower back pain, weakness of the legs, tinnitus, deafness or toothache. 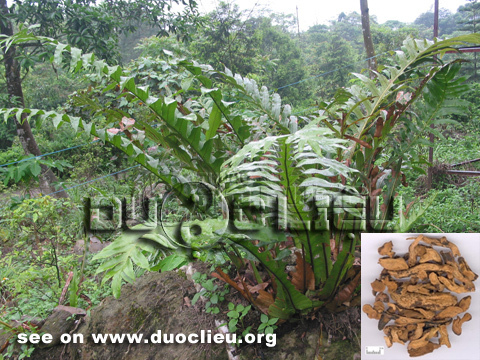 Drynaria (Gusuibu) is used with Psoralea fruit (Buguzhi), Cyathula root (Niuxi) and Walnut seed (Hutaoren) for lower back pain and weakness of the legs. Drynaria (Gusuibu) can also be used with Prepared rehmannia root (Shudihuang) and Dogwood fruit (Shanzhuyu) for tinnitus, deafness and toothache. 2. Swelling and pain due to external trauma or injury. Drynaria (Gusuibu) is used with Tiger bone (Hugu), Tortoise plastron (Guiban) and Myrrh (Moyao). Cautions & Contraindications: This herb is contraindicated in cases with deficiency of yin with internal heat and symptoms without blood stasis.